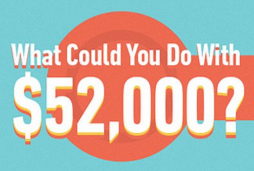 Now that you have the answer, think about how you could use $52,000. Amazingly, if you just let the money ride, you will pay off the 30 year loan in just a tad over 20 years. This estimate is based on a $200,000 loan at 4% interest. Now that was the easy part. Doing a math calculation to determine your potential savings is simple. Where will you find that $250 per month could be a more difficult question. Here are 5 ways that you could potentially get $250 a month in savings without reducing your lifestyle in any significant way. Call your cable TV provider. Tell them you are considering going off grid or switching to satellite. If you have satellite, call the provider and tell them you are thinking of switching to cable. Watch the dance begin. You are very likely to end up with at least $20 or more in savings. Now call the competition with your new rate and see what they will do. You are likely to end up with the same or better rate and a $200 gift card for switching. Go off the grid on cable. Between Apple TV, On Demand, NetFlicks, RedBox, Amazon Prime, and other TV offers, it is hard to justify any upgrades to basic service on cable or satellite. Saving on your utilities. The water company (at least in California) will be happy to help you cut down your water use. Check with your supplier to find out how to get free or reduced costs products to reduce use in bathrooms and irrigation. Then check to see what the recommended water needs are for your yard. The electric company will help you with lighting and other wasy to save on electricity. LED lights are fantastic and save a huge amount of money. Switch appliances to natural gas to save even more. Budget. Keep a penny by penny ledger of all expenses for three months. There are many online tools that can help with this process. Once you see where the money is going, you will almost certainly be able to find ways to cut that won't hurt even a little bit. Reducing your interest expense to create $52,000 is based on saving $250 and putting it towards your loan. That is a great way to save and to help with being disciplined about saving. You could potentially make even more money by investing the savings in various types of investment vehicles. With your mortgage at 4%, paying down the mortgage may not be the best use of the funds. However, it may give you the most peace of mind. All of the above assumed your mortgage was 4.5%. If it isn't, you need to call Bill Rayman and see if you can save money by reducing the interest rate on your current mortgage by refinancing. There is no cost of obligation for the free consultation with Bill.